Late Riser bars in purple ano and baby blue powdercoat. 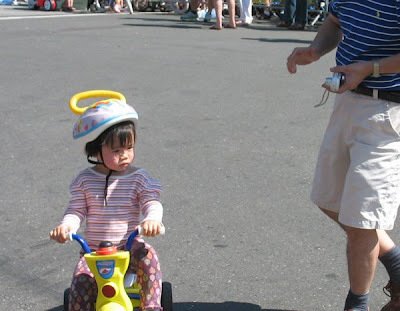 We don't know anything about the kid's helmet market, but have any of you seen anything like this? Is the yellow thing on top what I think it's for? The turnout for the kid's ride was huge. Probably over 250 participants from 4 to 12. 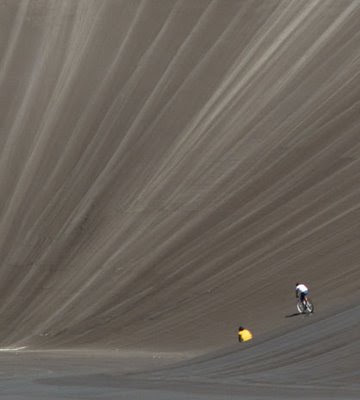 Biggest Velodrome in the World? We don't usually re-post other people's news, but there is always the exception. This is actually an accumulation pool at a hydro electric plant before it gets filled with water. These guys broke in and started riding in it. More amazing pictures at Muslauf. The new guy around here is testing one of our prototype lightweight plastic cages. Note the universal mount system. We are working on offering a custom color-match program for our bottles as well. 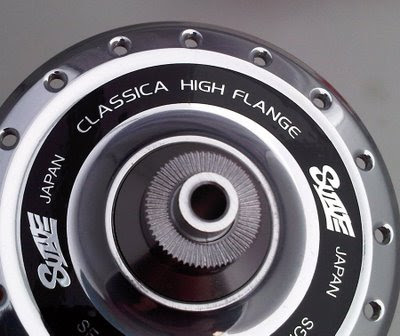 We also got our hands on the brand new high-flange Suzue Classica Road Hubs. 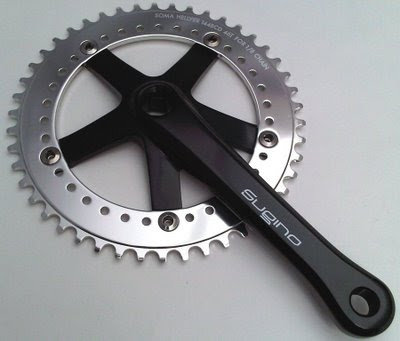 * 280g rear and 160g front! 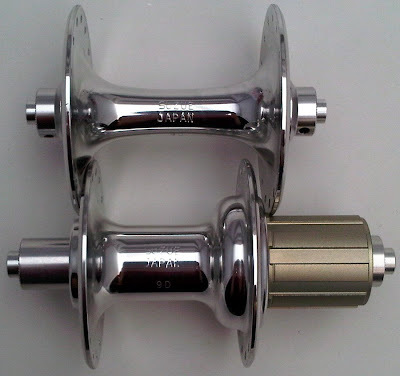 They look as good on an 80's Japanese touring bike as they do on a modern race-inspired frame. 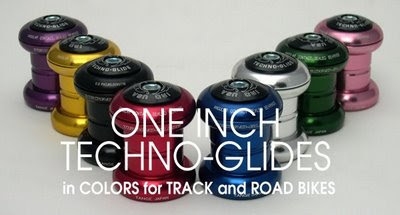 Our friends at Interloc Racing Design have made their Techno-Glide Headsets in anodized colors for a long time, BUT only in 1-1/8". Finally they have gotten around to making colored headsets for the 1" threadless( and threaded) crowd, which opens them up for so many fixed gear bikes which use that size. 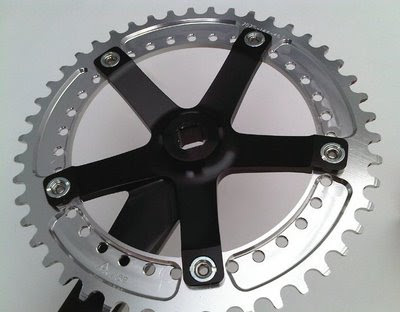 Any of these eight colors (including new additions -- purple and pink) would look fantastic on our black or white Rush track frames (the advantage of having a neutral paint color). 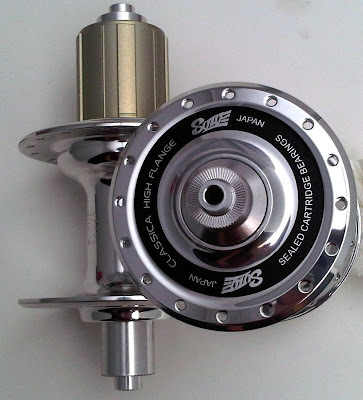 These are available on our online shop and at independent bicycle shops. We nearly forgot to send our sponsorship schwag to Josh and Trevor. Actually we did forget. And they reminded us. The weekend was off to an early start Saturday morning, with a ride of good distance planned. A couple Soma staffers and a friend took off from the city, fueled by caffeine and hopes for good weather. The Alpine Lake loop (roughly pictured above) can be ridden in both directions, in this case we rode counterclockwise. It involves some good climbing, with serious hills before and after the lake, with lots of rolling hills on the ridge leading up to and on top of Mt. Tamalpais. The descent down from Mt. Tam includes some sections of brand new road that are as fast as it gets, with Muir Woods as a backdrop. The weather at the lake and riding back to Marin was more ominous and overcast than sunny, but it was the right temperature for riding. None of us had been keeping to our Winter or Spring training regimens so we were a little beat by the time we rolled back into town, but it was a good start to the summer riding season. We are stoked to see the strong push for more urban cycling, commuting, grocery-getting and safer, friendlier streets. 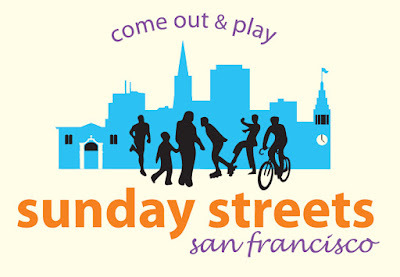 We have San Francisco Sunday Streets going on a once a month for the whole spring and summer, with one in the Mission this Sunday. This is a program that was first developed in Bogota, Colombia and involves opening up some streets to just non-auto traffic, so that bikes, skates and walkers can all use the roadway and explore new areas from a different perspective. Similar programs are in place all around the world, and we encourage everyone to speak with their local government and advocacy organizations to get a program in your neighborhood. A couple of us will definitely be rolling through come Sunday! 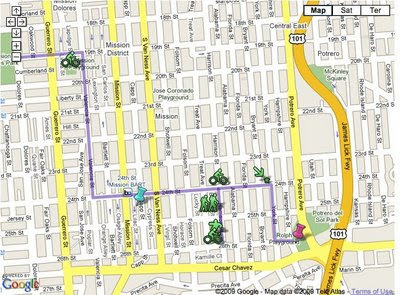 Click on the map to get a better view of the route. 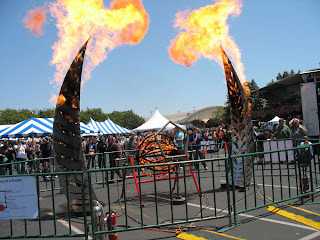 This past weekend was Maker Faire in the SF Bay Area. 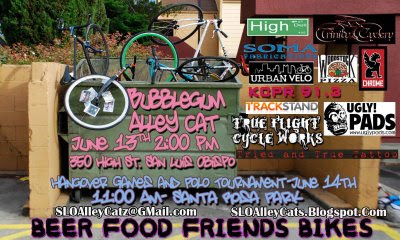 This event draws from the full spectrum of do-it-yourself-oriented folks for a weekend of robots, alternative bikes, steampunk culture, and general constructing and crafting. The life-size Mousetrap game and 10-foot Tesla coils (indoors no less) were definite highlights. Cycling was well represented, with Bike Monkey Magazine and Momentum Magazine booths, some crazy recumbent/scooter/wooden bicycle contraptions, and Cyclecide rodeo machines. If you haven't seen them around, Cyclecide is a local group that builds carnival rides that use the rider's own pedal power to operate the ride. The Exploratorium, San Francisco's "museum of science, art, and human perceptions" , had a serious footprint in the main hall. We have friends who work there, so we we spent a good deal of time at their booth. 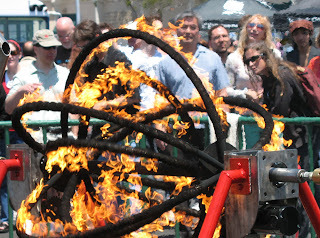 Their Chain Reaction exhibit, which allowed faire-goers to construct Rube Goldberg-style machines connected over a series of tables, was one of the more popular hands-on activities. The finale involved a bowling ball dropping ten feet onto an alarm clock. 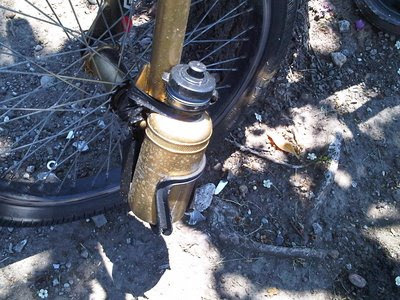 rear-steer bike for a ride. The Homegrown Village was a must-see area, with delicious cheese, beer, coffee and other offerings to be had, as well as education on clean water, composting, and gardening. Ritual Coffee was on hand, and the consensus was that there was not a better way to cure a caffeine jones than some of their iced coffee. It was good to see the full gamut of do-it-yourselfers offering up a very positive event. 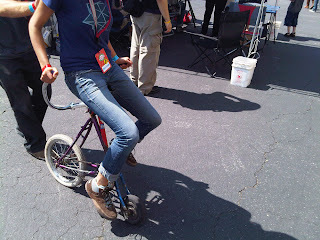 Maker Faire also showcases practical engineering. We had a friend manning the booth of Engineers Without Borders, which was showing multiple sustainable devices to improve quality of life in 3rd world communities. 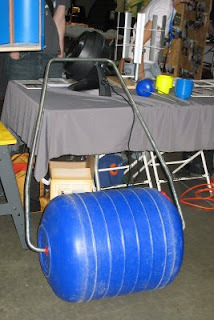 My favorite was the Hippo Roller a simple invention which makes it easier for people to carry water from wells and rivers. 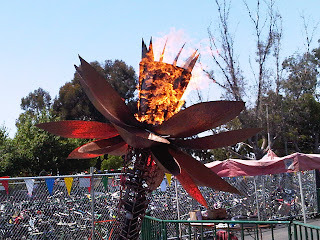 Best of all was the bike parking setup, with one estimate at over 500 bikes in the bike valet area. The packed Caltrain bike car full of families and their bikes was certainly a welcome sight, and hopefully the bike-friendly nature of the weekend encourages more folks to find pleasure and convenience in cycling. up the fences in the bike parking area. To see more pictures, go to our Flickr page.